Shamanic journeying is an ancient method that our ancestors from all over the world used to contact to their spirit helpers and guides. There were special people chosen to journey for others in the community. Because this was their primary focus they were able to devote their full attention to helping others. They became expert at it through their diligence. 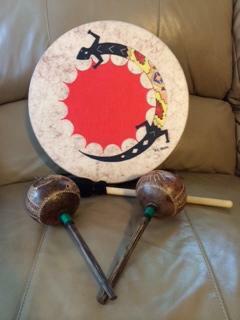 Drums and/or rattles were used and are being rediscovered today to create the vibrational resonance that allows one to journey. We are never alone, but sometimes we feel disconnected from ourselves, our world, and our true spiritual nature. These are the times when we feel confused, depressed, angry, sad, and many other similar emotions. Emotions serve the purpose of getting our attention. Once we listen, we usually understand the message. Shamanic Journeying is easy to learn. It is similar to deep meditation with a focus. Allow me to show you how to journey and meet with a compassionate spirit helper in the form of a power animal or spirit helper. Reconnecting with a Power Animal or Spirit Helper can bring great personal healing. Is it time for you to begin your own journey practice? Aren’t we all ready? Each instructional session will include pertinent information as well as guided practice. Learn to journey in a safe environment. Call or e-mail for more information or to schedule a session. Shamanic Journeying Session – $150.